Hej Jon, could it be that this spring is not "standard" and just added to pull the "Drosselklappe" ( what it is called in eglish ? ) back. 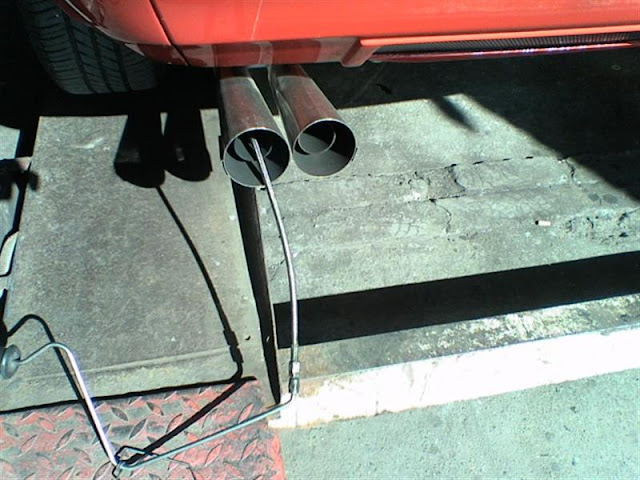 There are many 2.2 who have problems with the "Drosselklappe" because it it just sticks when the car is older. You are probably right. I just do not see any obvious places that it can be attached to the choke (drosselklappe) . The choke is hard to operate. The cable sticks and you have to push hard on the lever to turn it off again. I do have a new cable somewhere and I will install it as soon as I can find it among the spare parts. No no no, i don´t mean the choke. Google translate says it is called "throttle flap". Jeg mener denne runde skiver hvad sidder i karburatoren, hvormed gas bliver reguleret. The shaft, where it is screwed to, gets crooked when it is older. When the engine is getting warm and all parts are expanding it just stucks. There are many 2.2-owner who have attached a spring like yours to pull the throttle flap back. Hmmm.... I will check that and see if that is a problem and where the spring can be attached. Thanks. It is not a standard spring but as mentioned before the throttle hangs sometimes around 1500-2000 rpm. I have that to and some grease and oil in the front around the paddle and cable helps for a while. I also think it is used in the back to help the throttle come back. Do you have a picture of how the spring is attached? I saw it one time in 2007 on a 1.6 when I was looking for a Murena to buy. I was attached on the airbox to the valve-lever at the carb. The 2.2 I don't know. I still grease now and then. It's on my todo list to make a new cable there and take the mech in the front appart. I have searched the forum for any instructions on how to adjust the carburettor, but with no real luck. I was hoping that perhaps Roy had a "How-to" guide, but now I cannot find one on that site. I allready did the Weber on the 1.6. Send you some files about the CIC. Don't know if it's of any use. I forgot to mention that I did check the position of the slipper pads. They appear to be set correctly. In fact there was very little slack for the tensioner to pick up. I am confident the setup is good. That's good then Jon. It's always best when the slipper pads are close and the tensioner has less slack to take up. Regarding the spring from the tensioner, please keep it safe as it is always something that could be difficult to obtain if anyone needed one. I have the tensioner from Herman and will be using it later but I have another tensioner that has the spring but another part broken so I will be making one good one from the two. That spring you had left over from the carb. is definitely NOT an original part. No Murena ever had anything like that. I suspect someone had fitted it to try to get something that was too stiff, to return. When you say 'adjust' the carb. Jon, do you need to adjust the idle mixture screw? These are buried horizontally in the flange on the Solex 34 CIC. Let me know what the problem is and how you think it needs adjusting and I'll consider it. These are a 'fixed jet ' carb. so generally should need very little adjustment. You only have an idle screw and the idle mixture screw, and it is rare that the idle mixture screw needs adjustment. It only affects the idle setting and the transition to main system anyway. 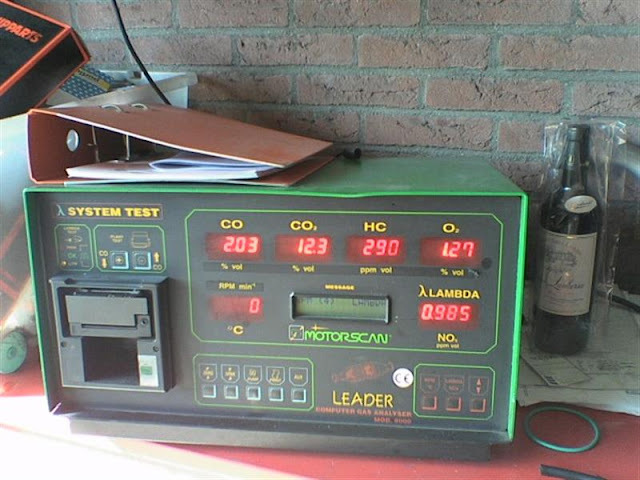 If you have an emission problem it is often something else that is causing the problem. Herman send me drawings of the carb that shows that the idle mixture screw can be in two places. Mine is facing the engine. When I first got the car I kept looking on the side where there is a hole matching the other location. My car has always smelled like it got too much gas at idle. At the MOT I was told that the CO in the exhaust was ok, but it was running very rich. I will try to adjust the idle mixture while measuring the exhaust with a lambda probe. Also I need to replace the choke cable. It is very hard to push back, so perhaps that is where the extra spring was used. Will check to make sure choke is fully open with the cable pushed in. Yesterday I replaced the choke cable. The biggest challenge was removing and reinstalling the clip that holds it in place in the centre console. I also had to bend the clip a little bit in order to hold the cable tight, since the new outer cable sleeve was thinner than the original. After attaching the cable to the choke lever and feeding it through the hole in the bottom of the console, I taped the ends of the old and new cables together with gaffa tape and pulled on the old cable from the engine compartment. After a little bit of tugging and twisting the new cable appeared. Got it fastened to the carburettor and adjusted. It now is smooth and easy to operate. Cranked the engine on the third try and drove a short 10 Km trip to the gas station and cleaned the windows. Pulling in to the carport I had it almost in place when the engine stalled. No power to start it again so it is sitting there waiting for the next challenge: Finding out why it did not charge. I have a new alternator, but the battery is 5 years old and has not been regularly charged for the past 2 1/2 years. To top it off, my electronic battery charger quit working. Taking it apart and measuring the components it appears that the thyristor is blown. So after getting a new battery charger and charging the battery again I found that I could start the engine about five times and then there was not enough juice to start it again. Checking the wiring to the alternator and comparing to the photo I took of it before replacing it, I see that it is wired up correctly. Trying out my new multi-meter with clamp-on Amp measurement (to 1000 amps ) I found that the alternator puts 19 amps into the battery, so conclusion is that the battery needs replacement. Wednesday the battery was replaced. (positive left pole is not easy to come by. most have positive right apparently) We shall see if that helped. Last summer I had both Murena's the battery bad. I bought 2 for low price (conventional calcium battery 45 aH). They last about 4-5 years because of periods standing still. My 2.2 it last longer because of electric fuelpump. After 2 months standing still it takes 2 seconds to start the car. It saves the battery in the long run.